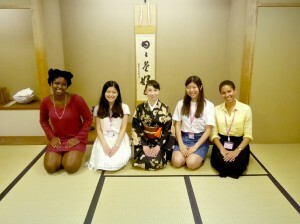 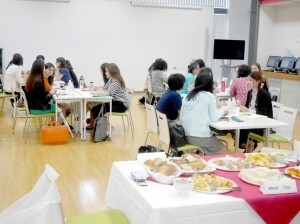 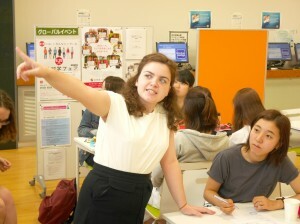 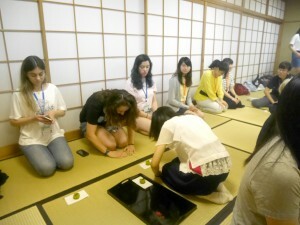 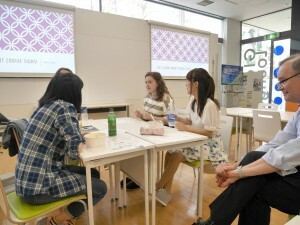 Following Chancellor Bando’s lesson from the day before, today the students had a lunch interview with Japanese women. 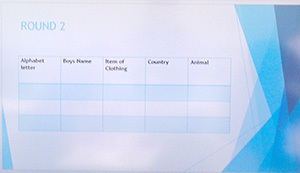 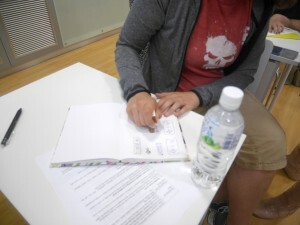 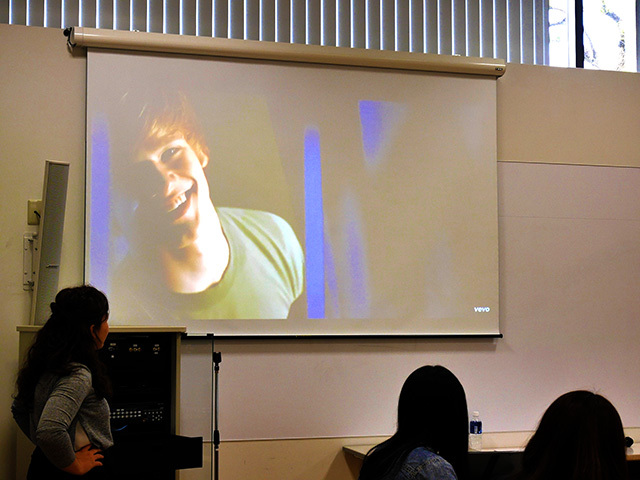 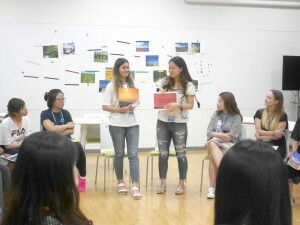 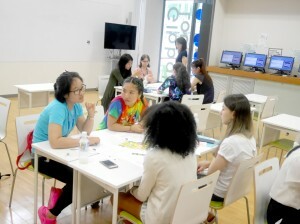 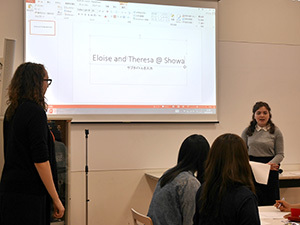 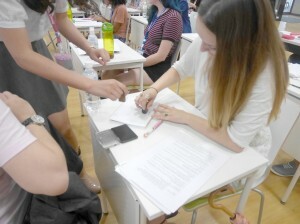 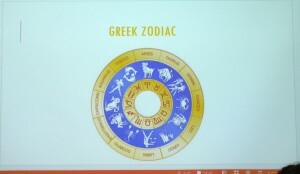 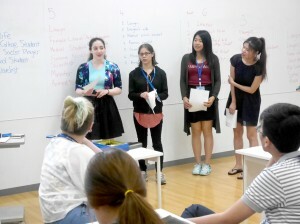 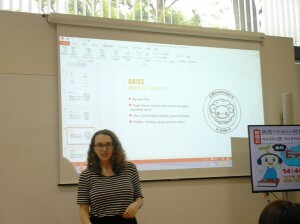 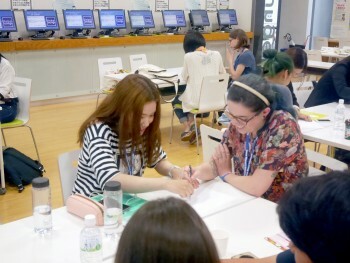 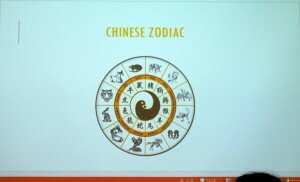 In the afternoon, the Cross Cultural Workshop started their research project on advertising. 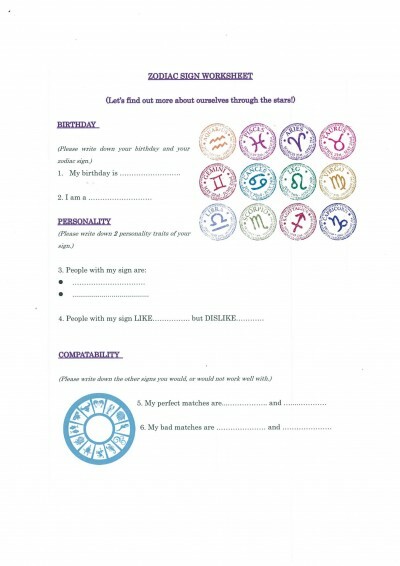 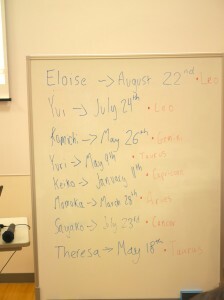 Dividing into groups, they went over research locations and began making plans for data collection. 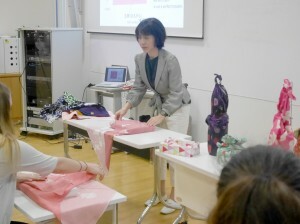 Tuesday started with a lesson on Furoshiki, both it’s history and different ways of tying the cloth. 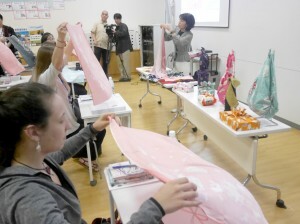 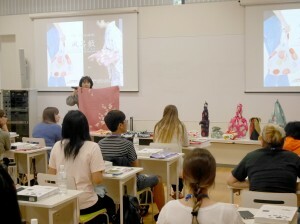 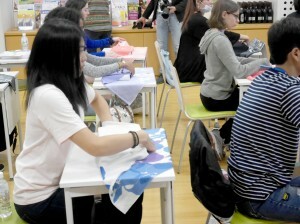 Students made bags, wrapping paper, and bottle carriers, and received a furoshiki to take home with them. 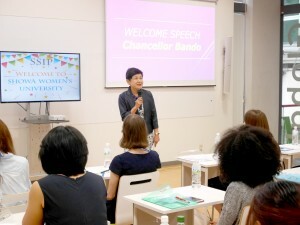 and a special lecture by Chancellor Bando on Japanese women made for an interesting afternoon! 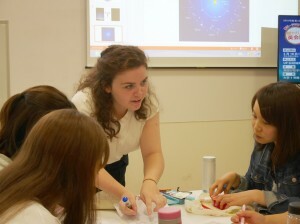 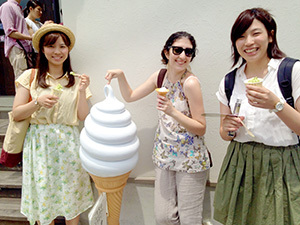 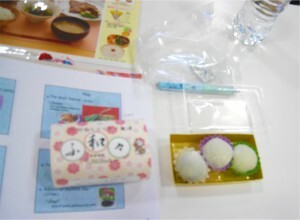 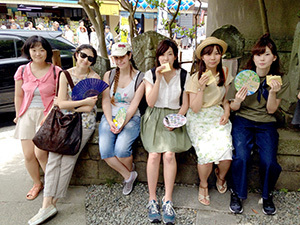 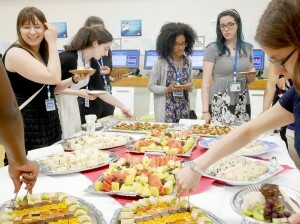 Today, students were treated to a lecture on Japanese food culture—and tasty snacks too! 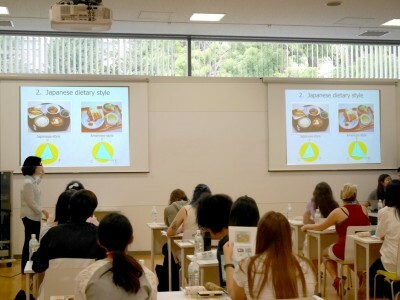 Focusing on the structure of traditional Japanese meal, rice, and seasonal food for festivals, the hour long lecture finished with a mochi tasting: matcha, red bean, and black sesame. 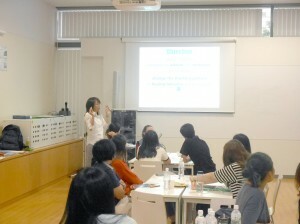 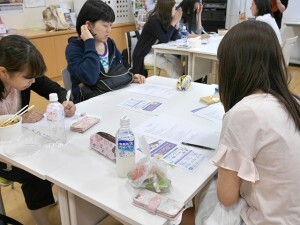 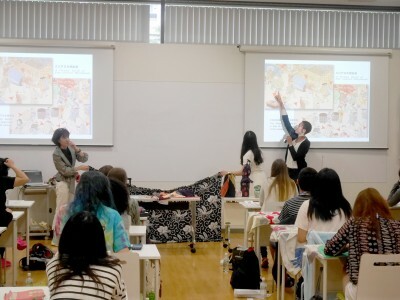 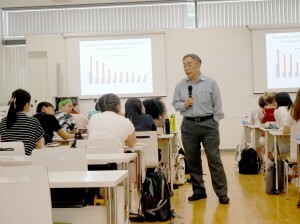 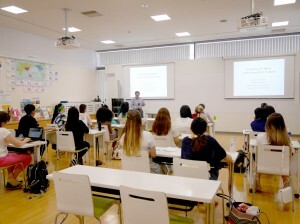 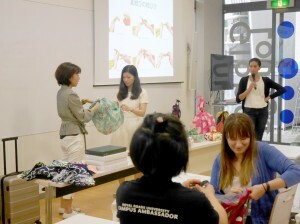 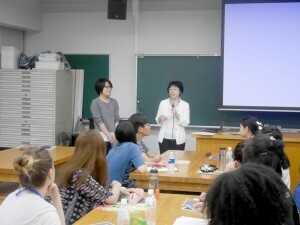 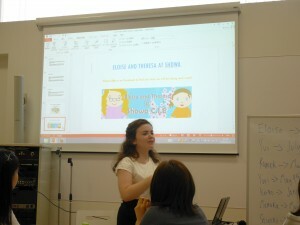 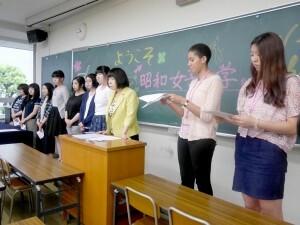 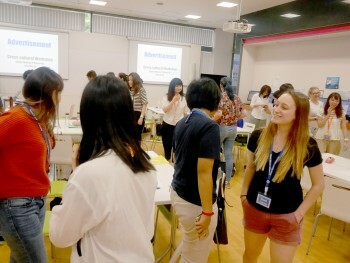 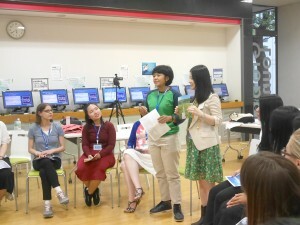 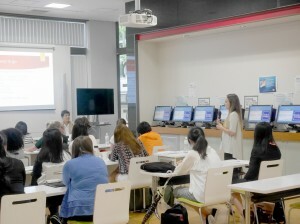 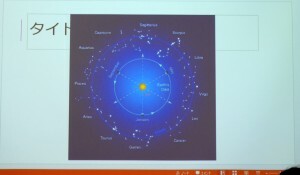 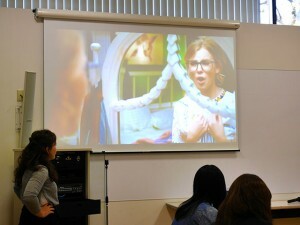 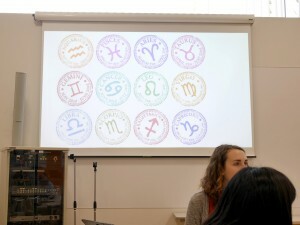 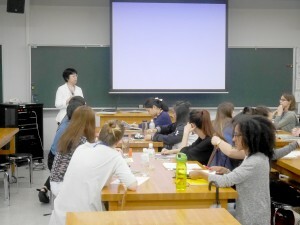 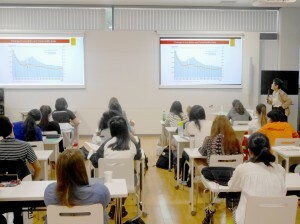 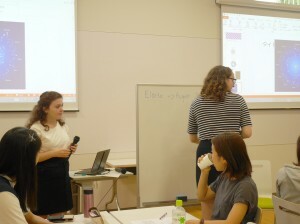 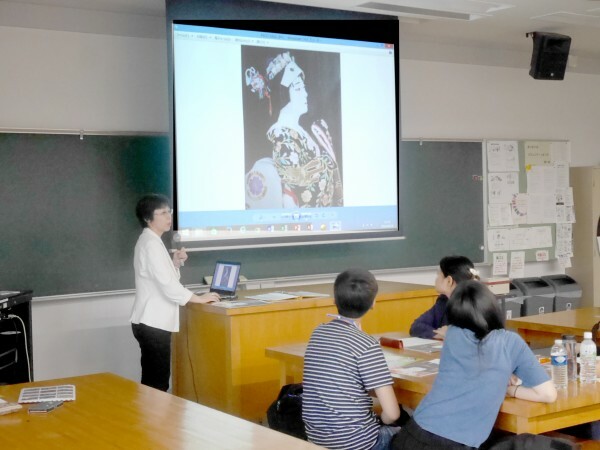 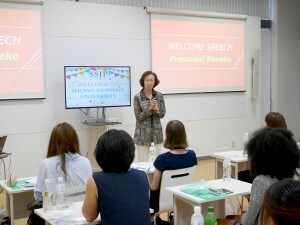 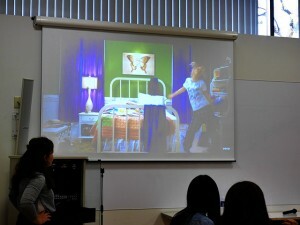 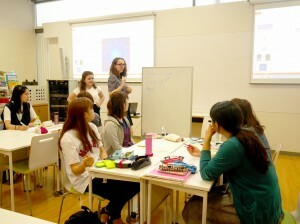 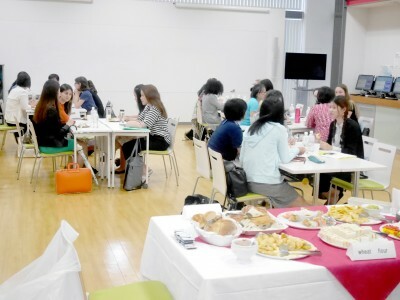 In the afternoon, a lecture on the declining birth rate raised conversation about the role of women in Japan and around the world. 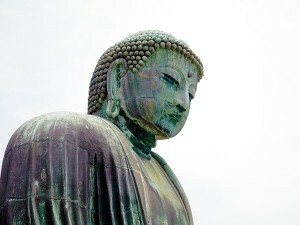 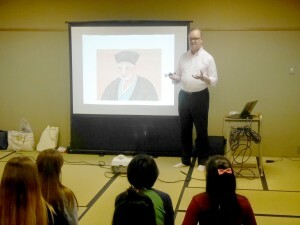 Today was dedicated to Japanese art and history. 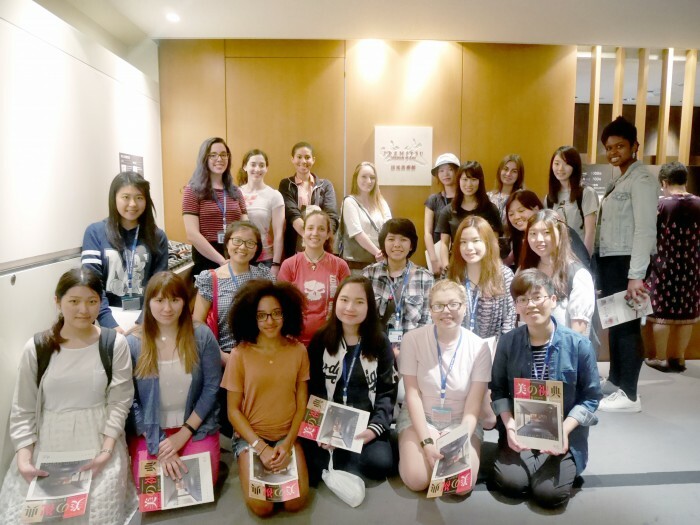 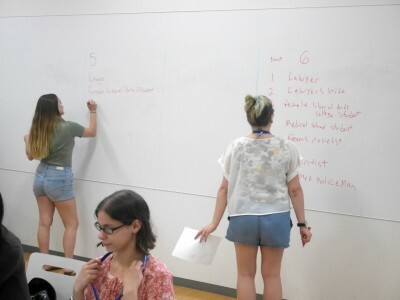 Beginning with a lecture on Japanese art, the students explored the history of art through out the ages, and followed it up with a trip to the Idemitsu Museum of Arts. 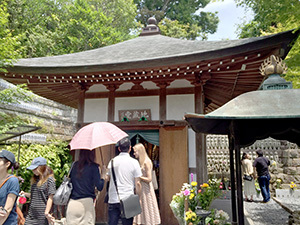 A private collection located near the Imperial Palace, the museum was celebrating its 50th anniversary and had a special exhibit on Edo paintings, screens, and scrolls. 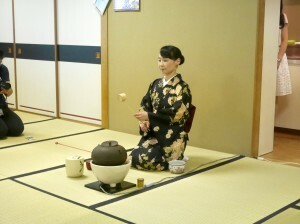 The majestic views of the Palace and the complimentary tea made for a great end to the day! 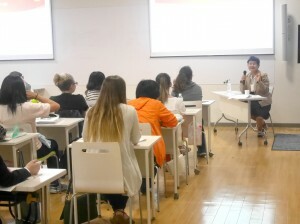 Today, students came to campus for a special Saturday session of the Cross-Cultural Workshop, focusing on intercultural communication and an introduction to advertising, the theme of this year’s workshop. 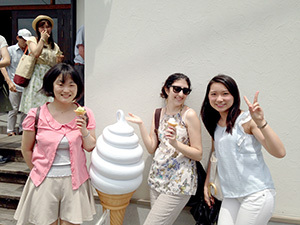 With Saturday afternoon and Sunday off, everyone was looking forward to some free time for exploring the city! 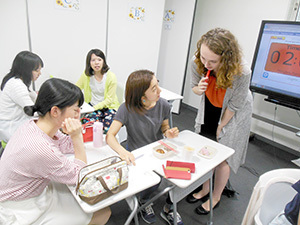 On the first day of classes, the students began with a lesson on the Japanese Tea Ceremony, led in part by CIE’s own Ashley Warren. 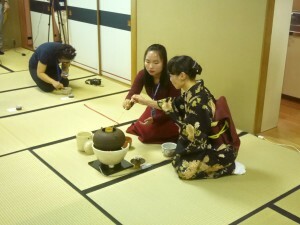 The students listened to a lecture on the purpose and place of the Tea Ceremony in Japanese culture, before sampling traditional sweets and trying their hand at making tea. 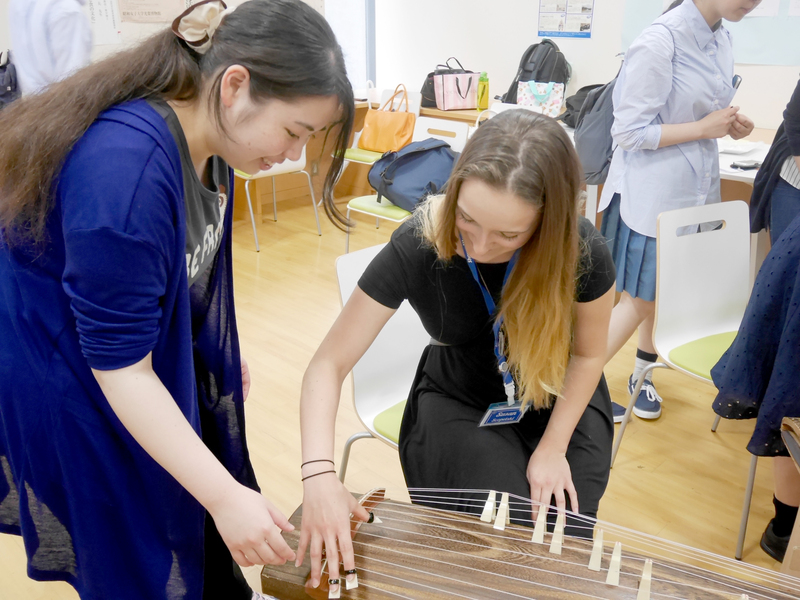 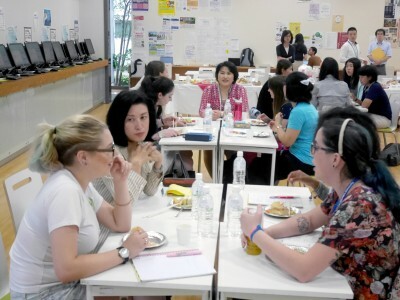 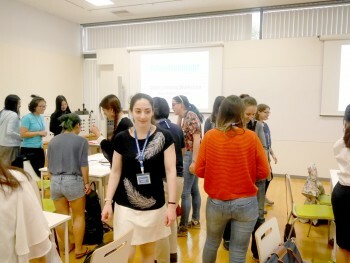 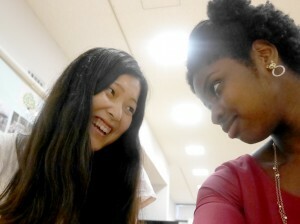 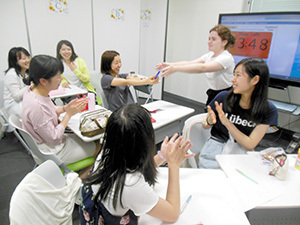 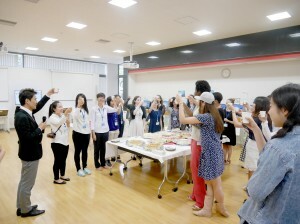 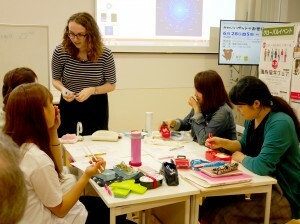 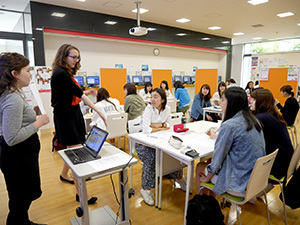 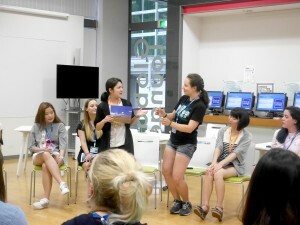 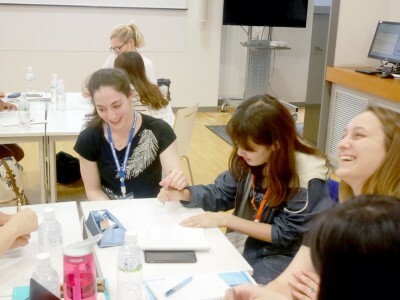 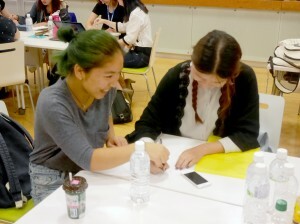 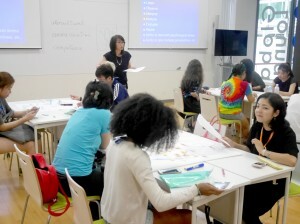 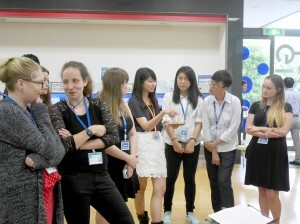 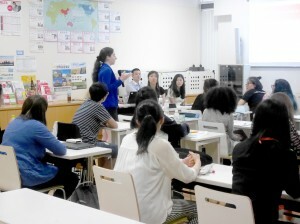 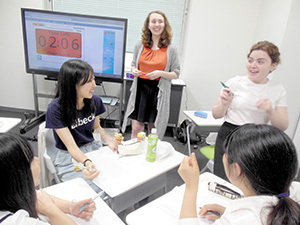 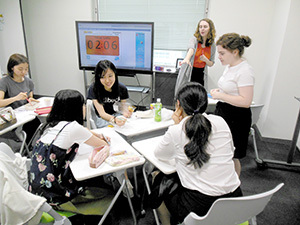 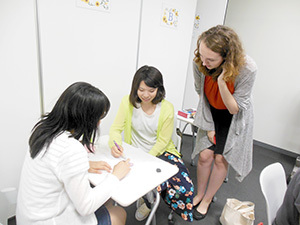 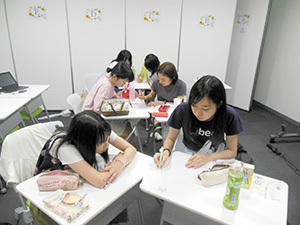 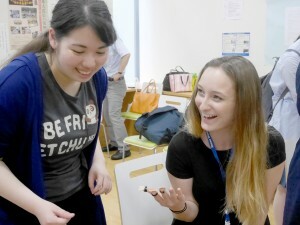 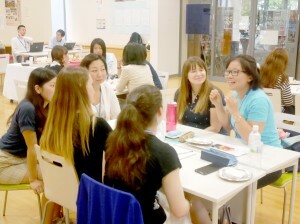 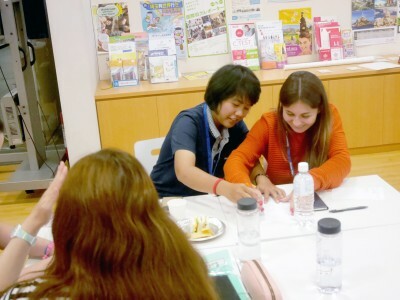 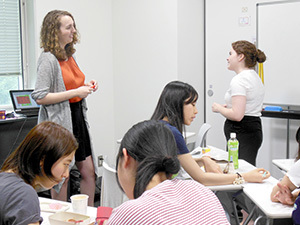 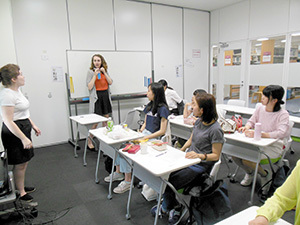 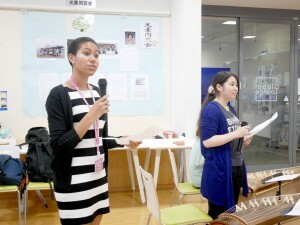 In the afternoon, the first lessons of the Cross-Cultural Workshop were led by Ommura-Sensei, bringing international students and Showa students together to get know one another. 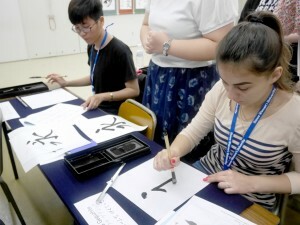 Thursday began with a practical lesson in Japanese calligraphy, giving students the chance to practice writing their names and favorite kanji. 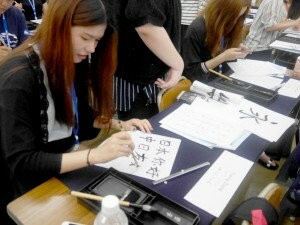 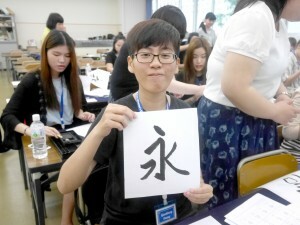 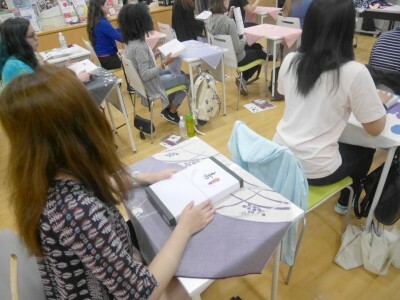 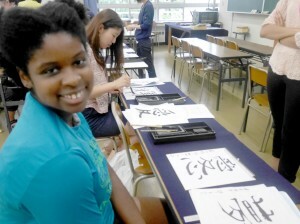 Aided by Showa students studying calligraphy, everyone was able to create a beautiful piece to take home. 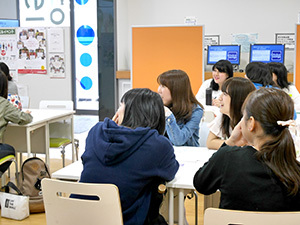 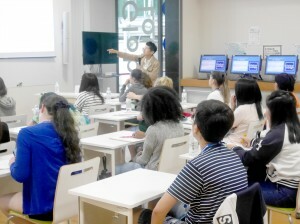 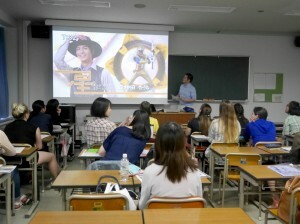 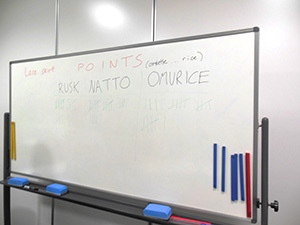 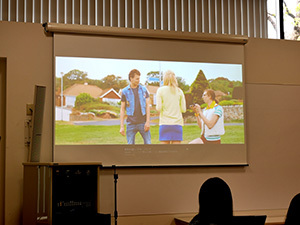 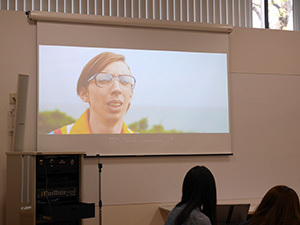 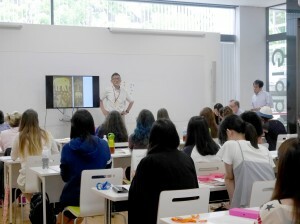 In the afternoon there was a rousing lecture on Japanese Pop Culture by Shigematsu-sensei, taught to both international students and his regular class. 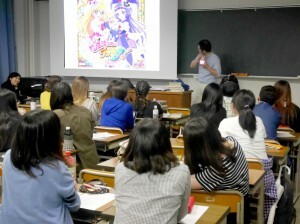 Featuring manga and anime of all genres, we studied the changes and developments over time. 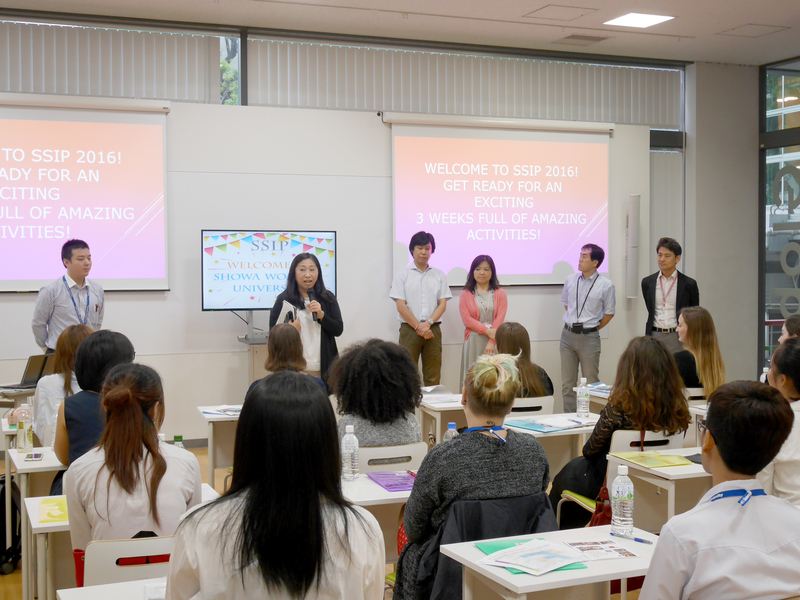 SSIP 2016 begins! 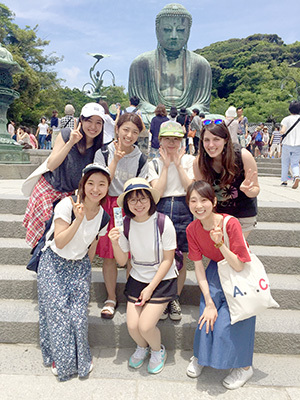 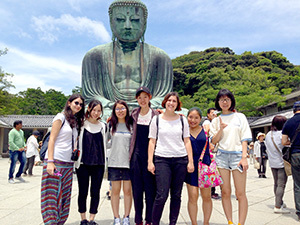 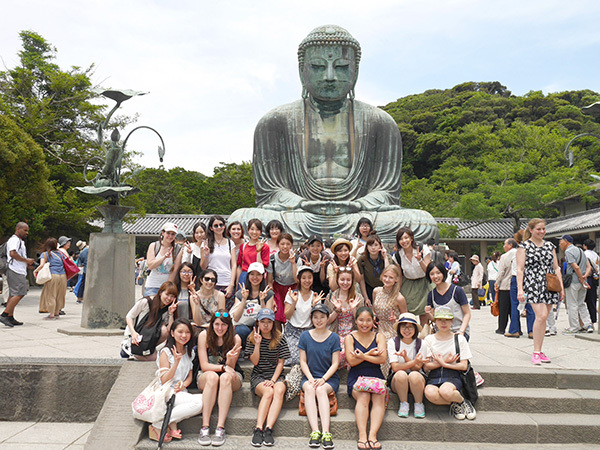 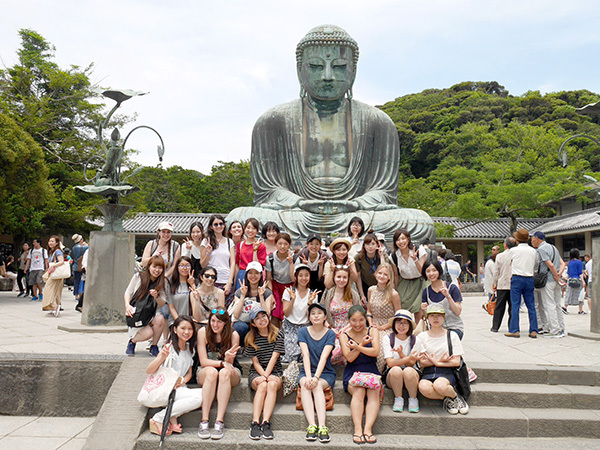 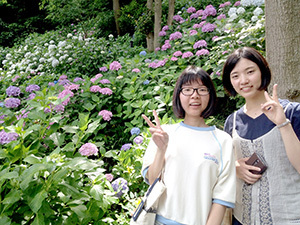 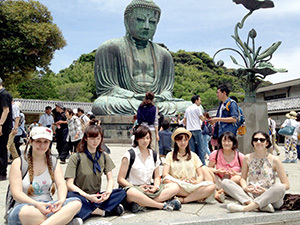 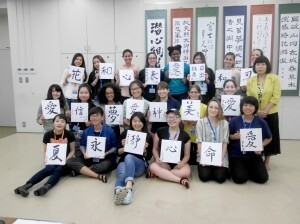 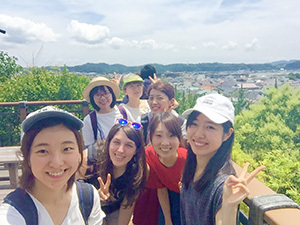 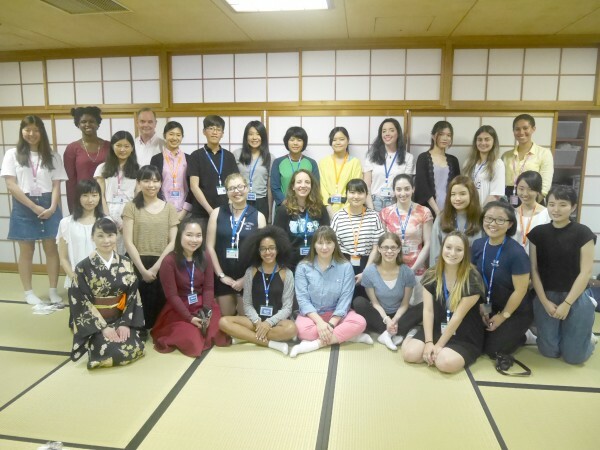 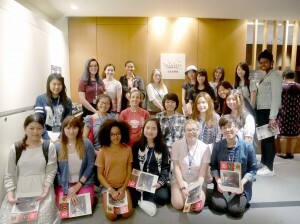 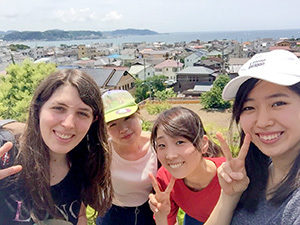 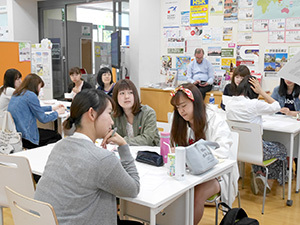 Today, 16 students from 8 countries arrived at Showa Women’s University, and moved into their rooms at the National Olympic Memorial Youth Center, near Yoyogi Park. 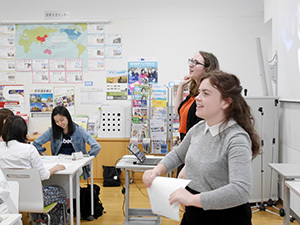 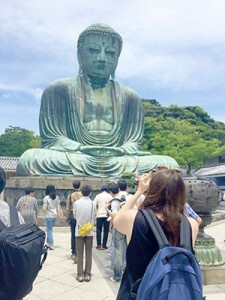 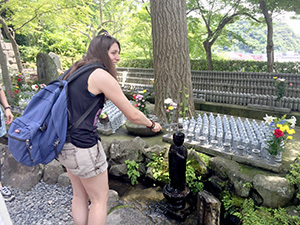 Despite being a little tired from the plane, and overwhelmed by Tokyo hustle and bustle, all the students expressed their excitement at being Japan. 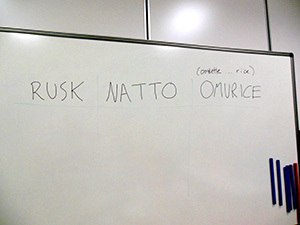 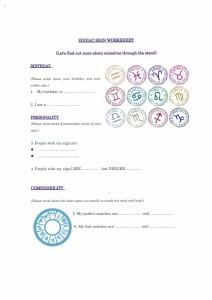 Starting tomorrow, the program begins in earnest! 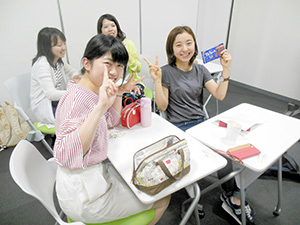 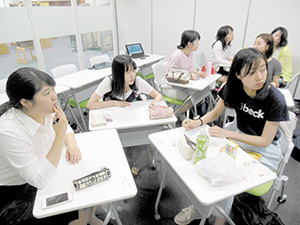 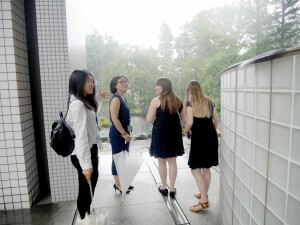 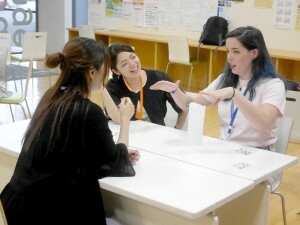 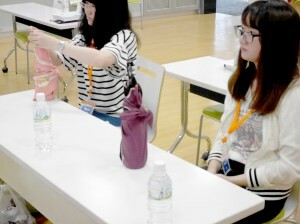 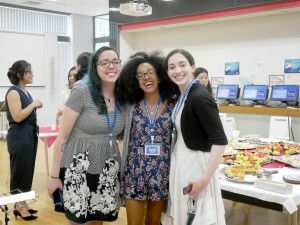 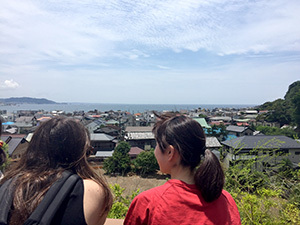 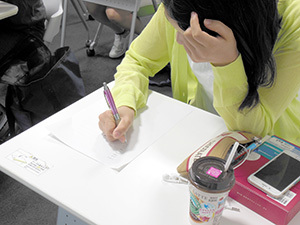 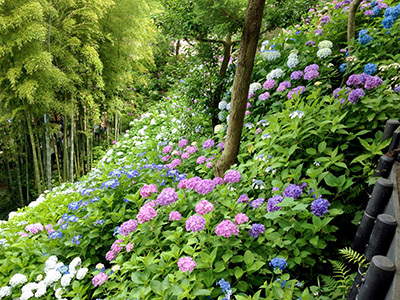 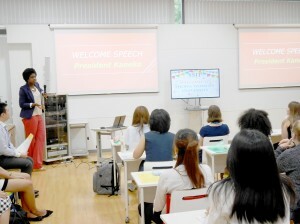 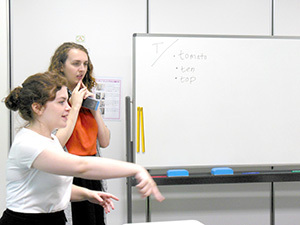 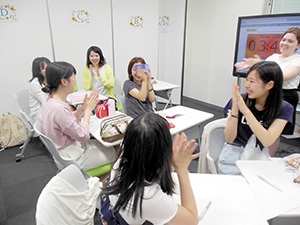 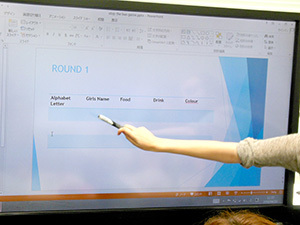 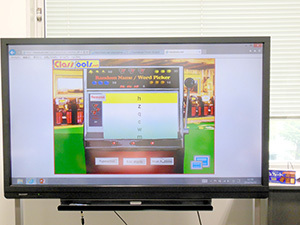 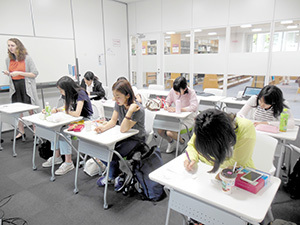 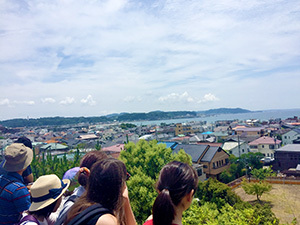 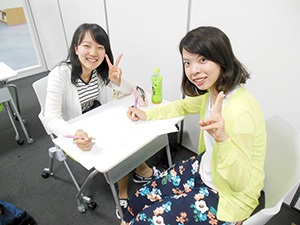 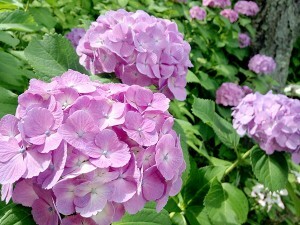 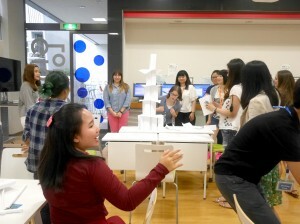 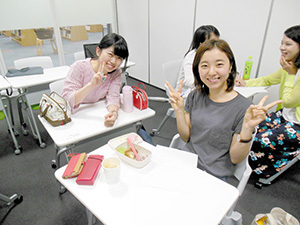 The heavy rain in the morning couldn’t keep spirits down as the students came to Showa’s campus for the first time. The day started with an opening ceremony, featuring speeches by President Kaneko and Chancellor Bando, as well as an introduction of program staff. The campus tour, led by SSIP interns, was more than a little soggy, but students enjoyed seeing Showa’s pond, library, and keeping an eye out for the famous gnomes! 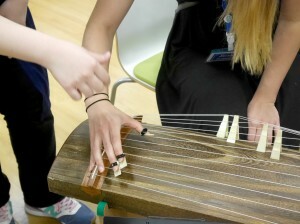 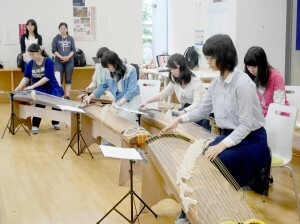 They finished the afternoon with a welcome party, complete with tasty food and a performance by the Showa Koto Club. 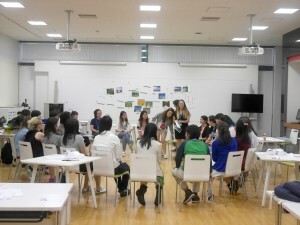 A great start to the program!